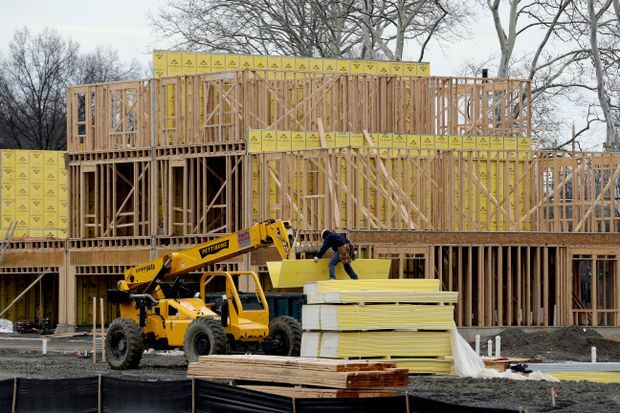 In this Feb. 26, 2018, file photo, work continues on a new development in Fair Lawn, N.J.
Economists polled by Reuters had forecast housing starts rising to a pace of 1.262 million units last month. Permits for future home building rose 2.5 per cent to a rate of 1.354 million units in March. Despite the rebound in home building last month, activity appears to be slowing. Single-family home building, which accounts for the largest share of the housing market, fell 3.7 per cent to a rate of 867,000 units in March. Confronted with these supply constraints, home building will probably not increase significantly to eradicate an acute shortage of houses on the market, which is pushing up prices and sidelining some first-time home buyers. Single-family home construction fell in the Northeast, South and West, but rose in the Midwest. Permits to build single-family homes dropped 5.5 per cent in March to an 840,000 unit-pace, the lowest level since September 2017. Starts for the volatile multi-family housing segment surged 14.4 per cent to a rate of 452,000 units in March. Permits for the construction of multi-family homes dropped jumped 19 per cent to a 514,000 unit-pace. The outlook for housing inventory was mixed. Housing completions fell 5.1 per cent to 1.217 million units last month, with single-family units dropping 4.7 per cent. But the stock of housing under construction rose 0.3 per cent to 1.125 million, the highest level since July 2007. Single-family units under construction climbed 0.2 per cent to the highest level since June 2008.